The Ghost Chasers Team has been featured in many local, national and international newspapers. 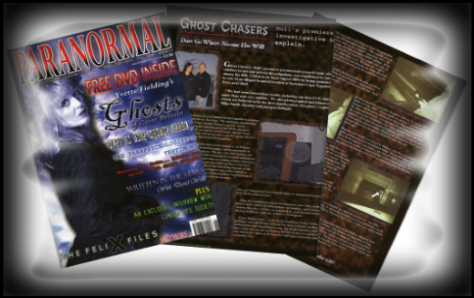 Most notably the team were featured in the premier edition of Paranormal Magazine, detailing the teams' achievements in a two page special highlighting their successes to date. Frequently the team have appeared in local newspaper Hull Daily Mail when parapsychologist Michael Smith was interviewed on 21 January 2006 in article entitled Look To The Skies when he explained what orbs are and which locations in Hull are most interesting than others and why and briefly again when the team began to conduct private investigations in the article, Ghost Busters Seek Local Homes. 22 February 2007 Michael Smith appeared on the front page of Hull's local free paper, The Advertiser where Mark Gee reported that Ghost Chasers were Looking for New Members of the Team. It was after this that the team secured a exclusive location, and it remains so today, that of Hull Paragon Station, one of the oldest buildings in the city and once again Hull Daily Mail covered this event in two reports, the first being Ghostly Goings On In City Landmark and again in a follow up report Ghostly Voices From City’s Hidden Past.